Hamburg is a city full of water and green spots. Especially the Alster is a huge magnet for everyone to go for a walk, to work out, to have relaxed picnics with friends or romantic first dates. A very popular area to hang out right by the water is the little park of Schwanenwik. It’s by the outer Alster, close to the Alsterperle (check the Alsterperle article) and you have a beautiful view over huge parts of the outer Alster. 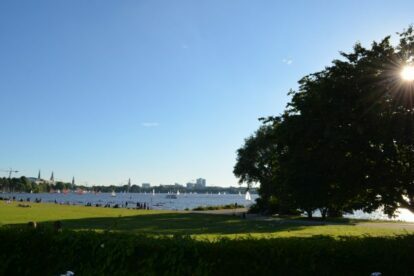 On sunny days, you will find tons of people relaxing in the sun, playing soccer or Frisbee, enjoying a picnic or barbecue with friends and simply appreciating the beautiful view over the Alster with all the sailing boats, canoes and ducks. There are usually always people playing music or even some who have brought their own guitar. So in case you are looking for a relaxed day in the sun but don’t want to spend it just by yourself, this will be nice place to hang out.